Vintage appeal and throwback style. 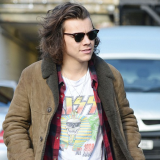 Wear Clubmaster sunglasses and you’ll achieve celebrity status. The retro shape is making a comeback with its classic look. 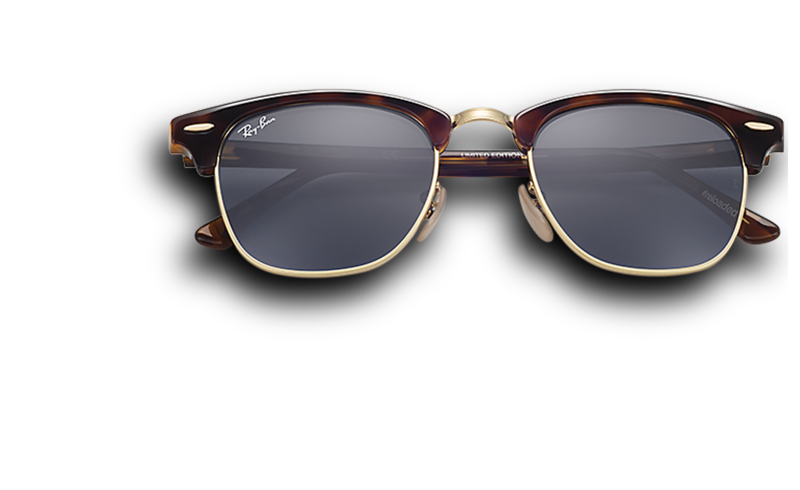 Hallmarks of the Clubmaster. 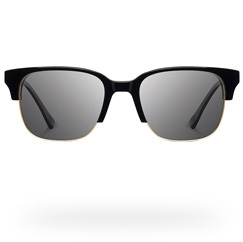 Like the browline, Clubmaster-style sunglasses are designed with an upper frame that is thicker or appears bolder than the bottom portion of the frame. Traditionally, the upper — known as the brow or cap — is made from a thick plastic or acetate that is also used on the temples. 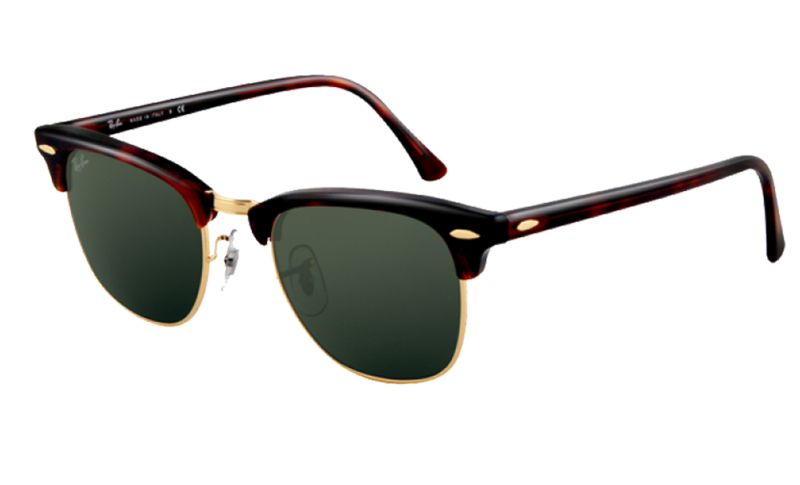 While Aviators or Wayfarers may be more common sunglasses frame styles among the general public, browline or ‘Clubmaster’ sunglasses hold a special place in the hearts of classic menswear aficionados. The style is both bold and instantly recognizable while at the same time subtle and classy. Browline glasses are a style of eyeglass frames which were very popular during the 1950s and 1960s, especially in the United States of America. The name derives from the fact that the bold upper part of the frames frame the lenses in the same way that eyebrows frame the eyes. The glasses were first manufactured by Shuron Ltd. in 1947 under the “Ronsir” brand and quickly emulated by various other manufacturers. The design became the most common style of eyeglasses throughout the 1950s and the early 1960s before it was surpassed in popularity by solid plastic styles. 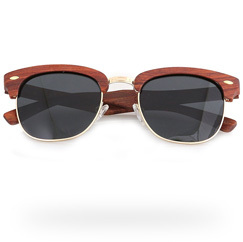 Browlines enjoyed a renaissance as sunglasses in the 1980s before returning to popularity in the 2010s, with the rise of retro style and the hipster subculture. Browline glasses are constructed in such a way that the upper portion of the frame is thicker than the lower portion, simulating additional eyebrows or otherwise drawing attention to the wearer’s natural brow line. The most common means of construction is for the upper portion of the frame (the “brows” or “caps”) and temples to be made of plastic, with the remainder of the frame (the bridge and eyewires, or “chassis”) to be made of metal. The chassis inserts into the brows and is held in place by way of a series of screws. For a period in the 1960s, numerous models emerged in which the brows were constructed from aluminium; following the style’s resurgence in the 2000s, browlines made wholly out of one type of metal with less pronounced brow portions became popular. 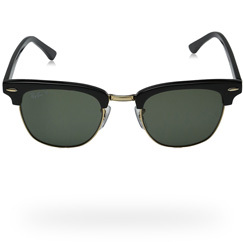 Selena is a big fan of Ray-Ban® RB3016 Clubmaster™ Sunglasses and often sports them strolling around LA. David Beckham in Ray-Ban® RB3016 Clubmaster™ sunglasses is using the style top off a look that is smart, but not overly formal. 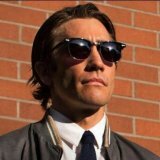 Giving Jake a distinguished look, he often seems to wear Wayfarers in his movies. Bruno Mars spotted wearing his Clubmaster sunglasses. Nothing does classic cool like the pilot. And with a design advanced enough for the cockpit, you’ll enjoy the view. This classic shape is an eyewear icon. It’s been around since the ’50s, but its versatile style is totally timeless.